Rotary Club of Mineral Wells President JJ Dugan, center, accepts on behalf of the club Mineral Wells ISD's recognition as its "January Partner in Education." The presentation was made at Monday's MWISD school board meeting. 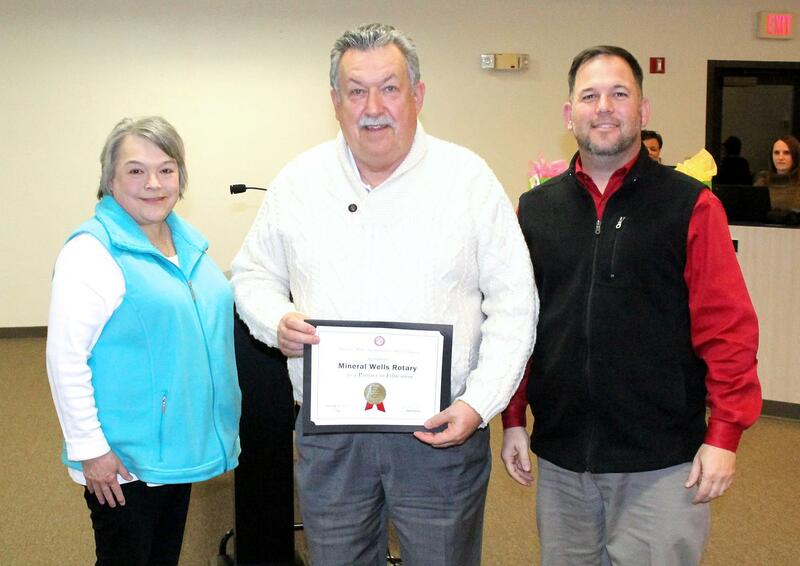 Dugan is pictured with MWISD board President Maria Jones, left, and MWISD Superintendent and Rotarian John Kuhn. Rotary Club recently provided Mineral Wells High School with a $4,000 grant to help homeless students with educational supplies and needs. Each year the local club's president selects a project to fund and assist, and helping local homeless high school students was the project Dugan selected for his term. The monies came from local funds, obtained through fundraising endeavors Rotary's U.S. flag subscription service for homes and businesses and the annual Crazy Kicker 100. The local club's funds were equally matched by Rotary International through a Rotary District 5790 grant. "The educational challenges associated with homelessness are broad and extend to every corner of a child's life," said MWISD Public Information Director and Mineral Wells Rotarian Karyn Bullock. "Without consistent access to food, shelter and safety, students are often too hungry, tired and stressed to keep up in the classroom. Many times, hidden in plain sight, homeless students are present in our classrooms, programs and communities, and they need our help." The grant was provided for discretionary use by the high school's counselors as they see fit for students identified as homeless.